Andrew White Quartet, Live at the New Thing. What a find! There can't be too many of these around. Two-LP set of the legend, most importantly backed by Eric Gravatt. As far as I know, this is the only conventional quartet date of the phenomenal Gravatt from the era (1970). Gothic font. Hell yeah. Worth the price for the extensive blurbs by Ron Carter, Wayne Shorter, and Josef Zawinul. 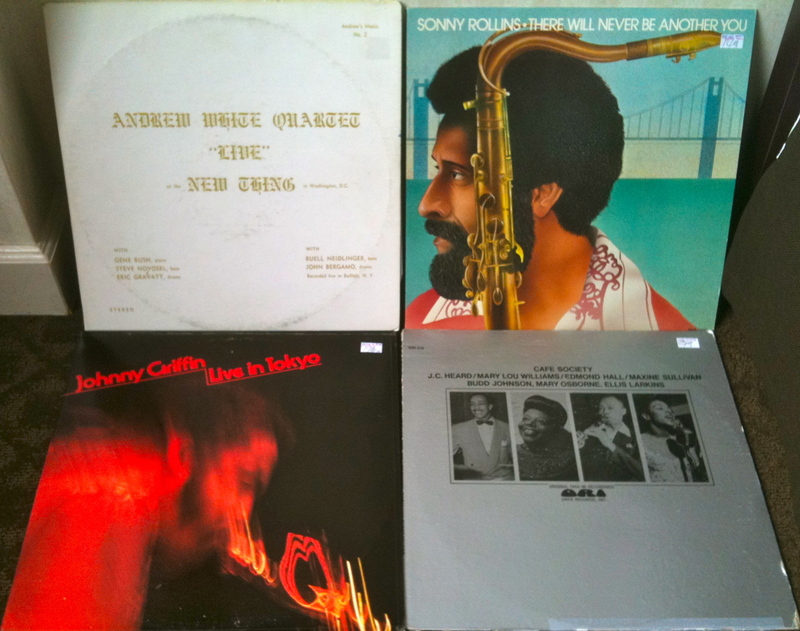 Sonny Rollins, There Will Never Be Another You. I looked everywhere for this when going in to interview Mickey Roker, but it hasn't been re-issued even though it is on Impulse! A live session in the rain with two drummers, Roker and Billy Higgins. Had it in high school, didn't like it much, now I know more, glad to have it back. Johnny Griffin, Live in Tokyo. A big hall in 1976 with a good band, Horace Parlan, Mads Vinding, and Art Taylor. I'm always on the lookout for 70s performances by canonical bebop drummers. H'mm, only five tunes on a two-LP set. I suspect I'll be hearing some 16th-note runs from Griffin on this! Cafe Society — Original 1944-46 recordings by J.C. Heard, Mary Lou Williams, Edmond Hall, Maxine Sullivan, Budd Johnson, Mary Osborne, and Ellis Larkins. Music I should know and don't. Heard Sullivan on the radio once and loved her. Not in great condition, but Dan Morgenstern's liner notes are worth it for sure. Ted Allbeury, The Lantern Network. Matthew Guerrieri said what I'm looking for very well: "…One of those really good understated 1970s thrillers where everything's in sharp focus and it's smart enough to assume you'll think for yourself and it's tricky enough to keep you on your toes, and when it's over, everything around you seems to have just a touch more clarity." Dunno if I've ever read a great Allbeury but I re-try him once in a while. Margery Allingham, More Work for the Undertaker. I looked at her classic Tiger in the Smoke again recently and really enjoyed it. Peter Abrahams, Last of the Dixie Heroes. 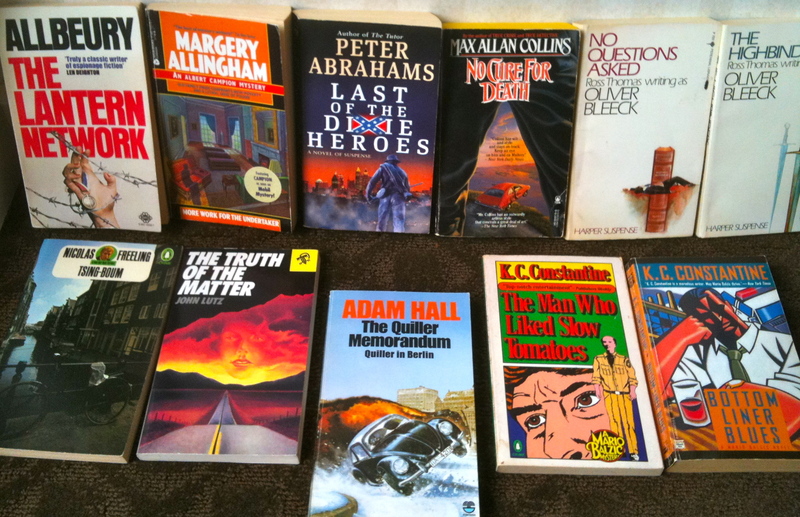 Once of the best these days, Abrahams's thrillers are always built new from the ground up. Max Allan Collins, No Cure for Death. I'm impatient for the forthcoming Quarry, this can hold me for a moment. Oliver Bleeck, No Questions Asked and The Highbinders. I adore Ross Thomas but have never read his pen name. Nicolas Freeling, Tsing-Boum. Books that look at our war in Vietnam from the European perspective are always interesting. John Lutz, The Truth of the Matter. I really dig a couple of Lutz short stories but haven't found the right novel yet. Maybe this will be the one. K.C. Constantine, The Man Who Liked Slow Tomatoes and Bottom Liner Blues. After recently blogging about Constantine I noticed my collection was decimated for some reason. I've read these before, they are most likely the greatest books on this list. 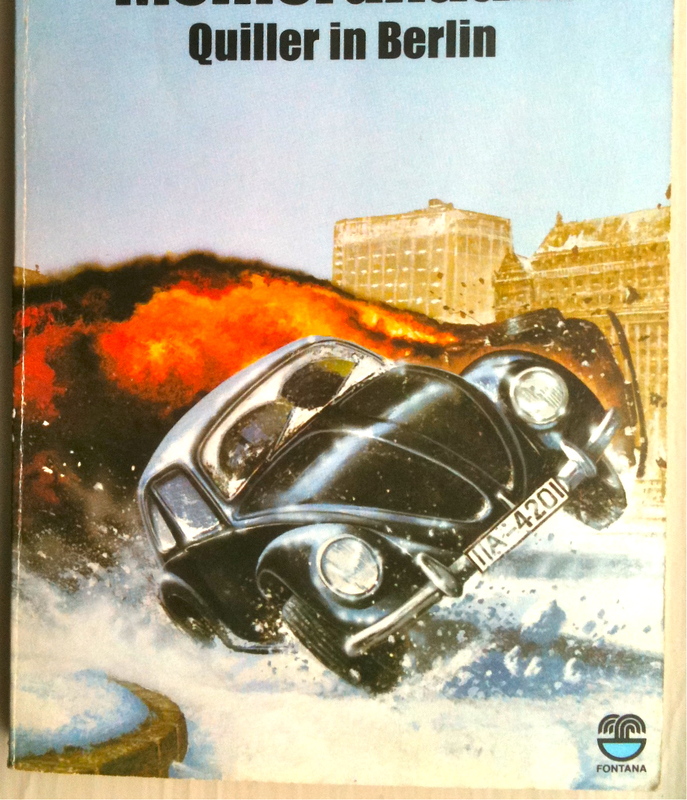 and, yes, that is exciting car action featuring a Beetle. Adam Hall, The Quiller Memorandum. The franchise is worthless. But the first volume has some acclaim, although I can't remember it very well. I got this for the hysterical cover.